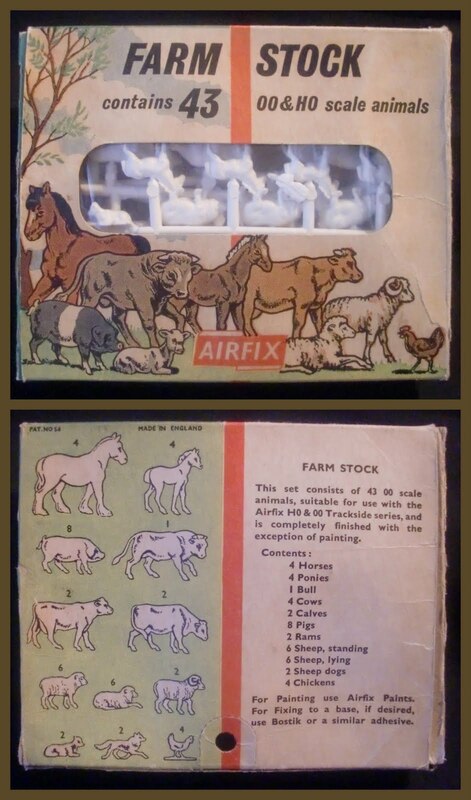 The early or 1st version box, the beauty of the first boxes from a collectors point of view is that if one is starting out as a new collector, and hasn't encountered PSR, heard of the Airfix Tribute Forum or never met Eric Williamson's website, they give a complete list of the content on the back, allowing the newbie to start building complete sets from 50p bags, car-booty and eBay graveyard lots. 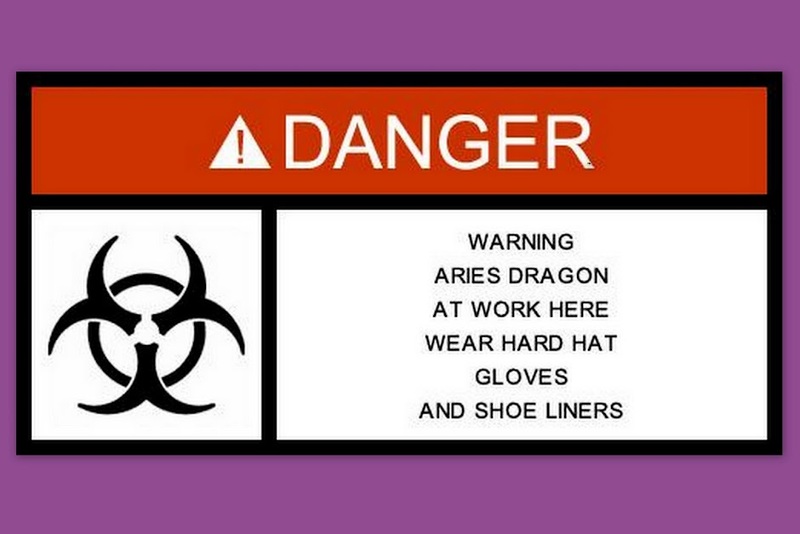 Eventually the new collector discovers PSR or - eventually - this blog, where he finds all the information needed to check sets. 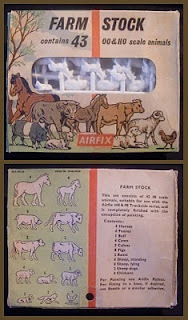 Once he/she has the sets (and boxes if he/she has gone that route), the desire to collect needs stoking with new angles, the first of which is colour variations, in this case only the two were issued by Airfix. 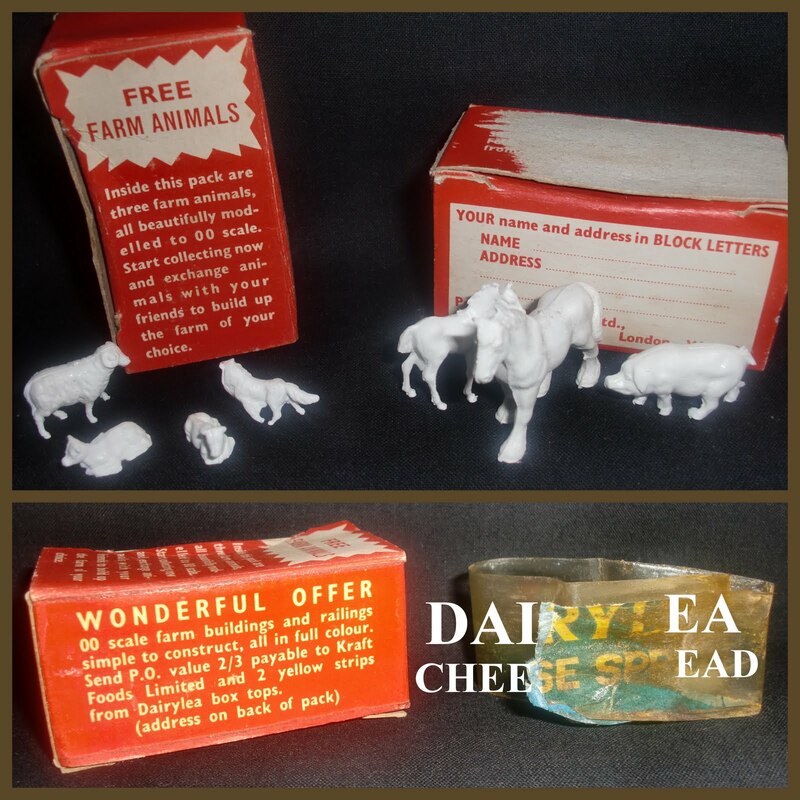 Once this new aspect has been fully sated, the collector will start to seek all other forms of the chosen field, and a lot of these early Airfix sets were issued as premiums with foodstuffs, comics or magazines, in the case of the Farm Animals this was Kraft (now Craft) Dairylea Cheese Spread. These are nearly always in a poor condition as they were firmly taped to the cheese box with a one-inch strip of Sellotape on three sides. I did have a better one, but felt it was greedy to hang on to all three, and made sure the person who most needed it - got it! The fascinating question is - what does the "OO scale farm buildings and railings simple to construct...." look like? I'm guessing a card item? Maybe the same 'Attack Force' type card once shown in the Airfix Catalogue? Once the terminal phase of collecting has set in, the collector having convinced themselves that they are embarked upon a task of historical research, of vital importance to the nation and wider world (guilty as charged M'Lud), the aim is to collect anything and everything remotely connected to the original target. Here we see Hong Kong piracies of the Airfix set from several sources, the bags bottom left contain only the Airfix poses, while the animals at the top came with the Airfix Zoo Llama and J & L Randall/Merit horses two shots below. 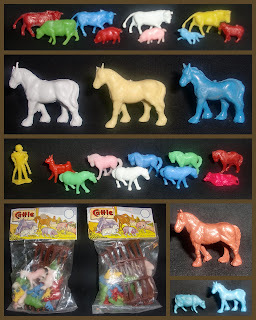 The blue pair bottom right, may be from the bags, but in a different colour, certainly the sprue-release point is the same, while the brown horse, of particularly poor quality (and re-cut tail), comes from a third source altogether and the fluorescent pink Merit-copy cow may be unconnected with the others and appearing on this page under false pretence? 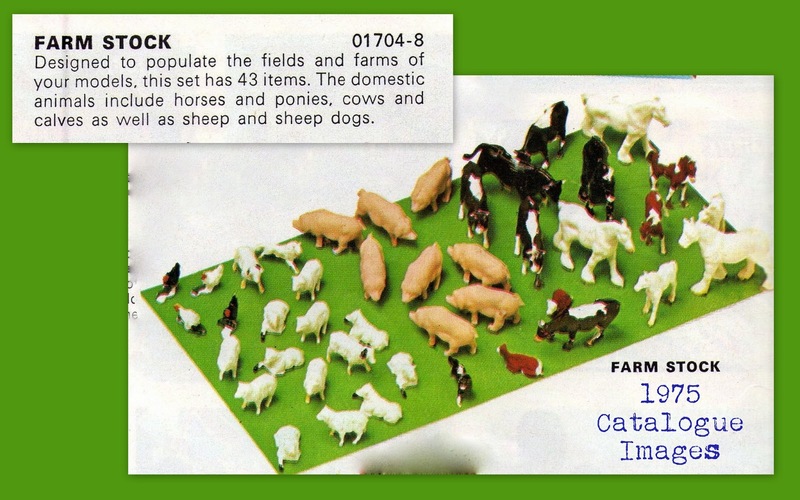 Courtesy of Kostas, a blog follower from Greece, we have this Piacasa'd collage of the image and blurb from the 1957 catalogue, I used to love these painted sets in the catalogues when I was a kid, although as a farmer I'd view this particular field as a bit of a handful! An interesting colour variation; although all the set that aren't 'cream' are 'white', there is some variety within the white range, and here we see a set on the left from the blue spectrum, giving a very white white! With - on the right - a (very brittle) set of a warmer white from the brown or red end of the spectrum. 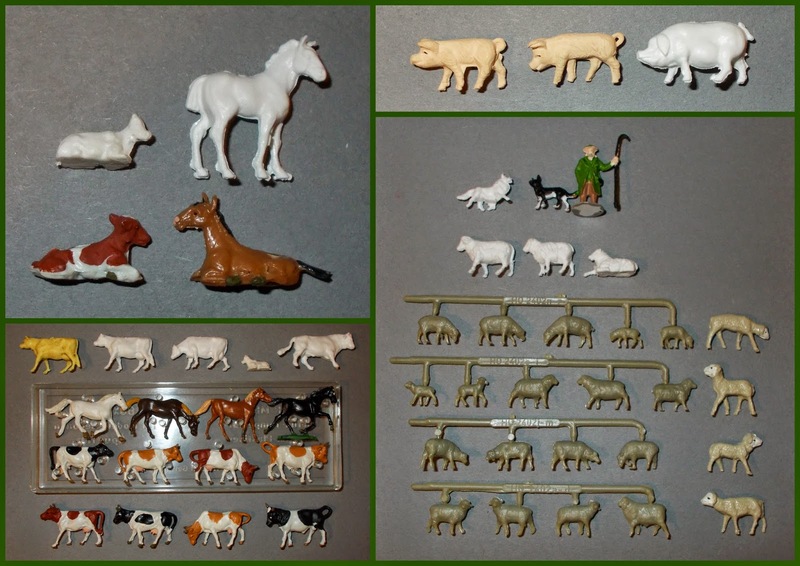 Another set of 'cattle' with a nice selection of different-coloured sheep-dogs and green horse...because every farmer needs a green horse! 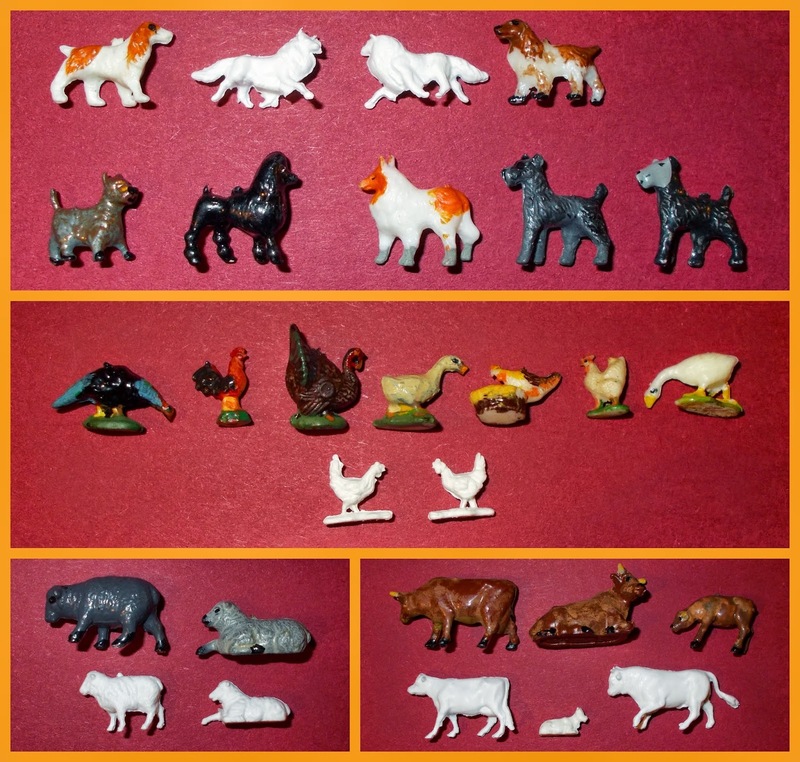 The ready-reckoner line-up, these are nice sculpts, and would have made a nice change from the heavy-metal of Britains Lilliput or the Crescent farm animals available to model railway enthusiasts prior to the appearance of this set. 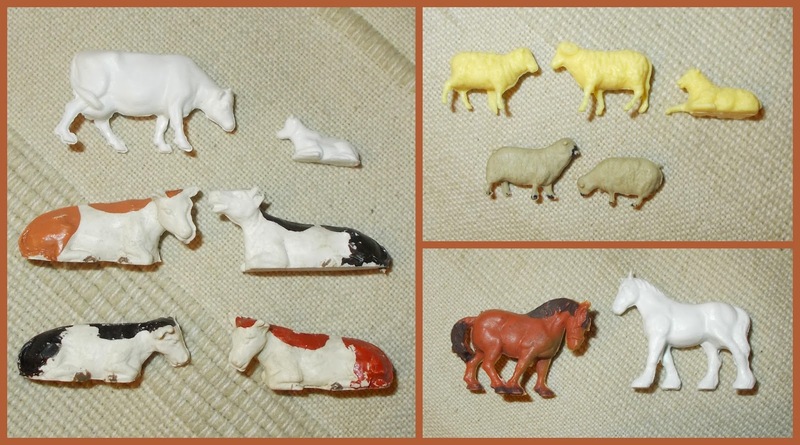 Size comparison between the - deliberately - confusingly-named HO-OO Airfix and the actual OO gauge animals from Merit/Modelscene...the Merit cows win best of show, the Airfix horse takes the equine rosette and the sheep match-up quite well in length/hight, but the Airfix animals seem to have been better fed with a width/girth that looks healthier, we'll put it down to different breeds! 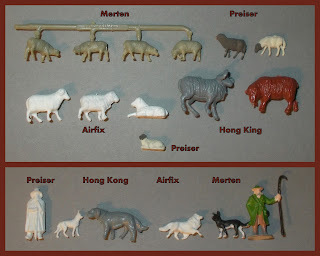 Comparison between the domestic animals of Merten and Airfix's own Farm animals along with the shepherd. 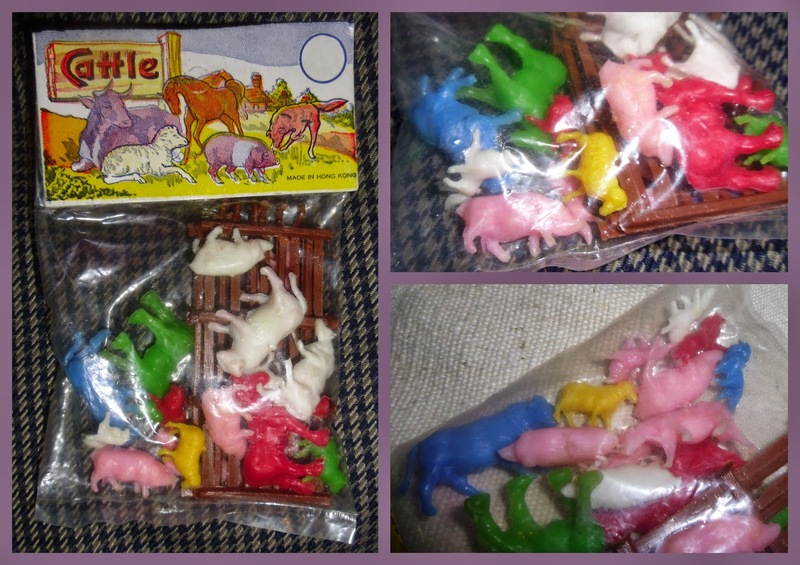 The two rather large piglets and the four equally large loose lambs may be from the O-gauge (40mm) Merten range, or they may not be Merten at all...I'm not too sure! The Merten HO range is very compatible though. 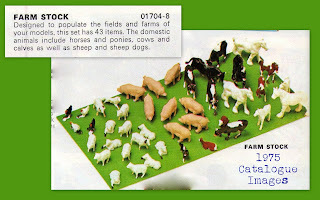 This comparison is with Marx farm animals and a set of dogs which I also think are Marx. The Marx 'Miniature Masterpieces' were described as HO but are far too big for British (or 'rest of the world') layouts, seeming to be more in line with the 1:64th scale 'HO' of Ertl and the slot-racing circuit in the USA. 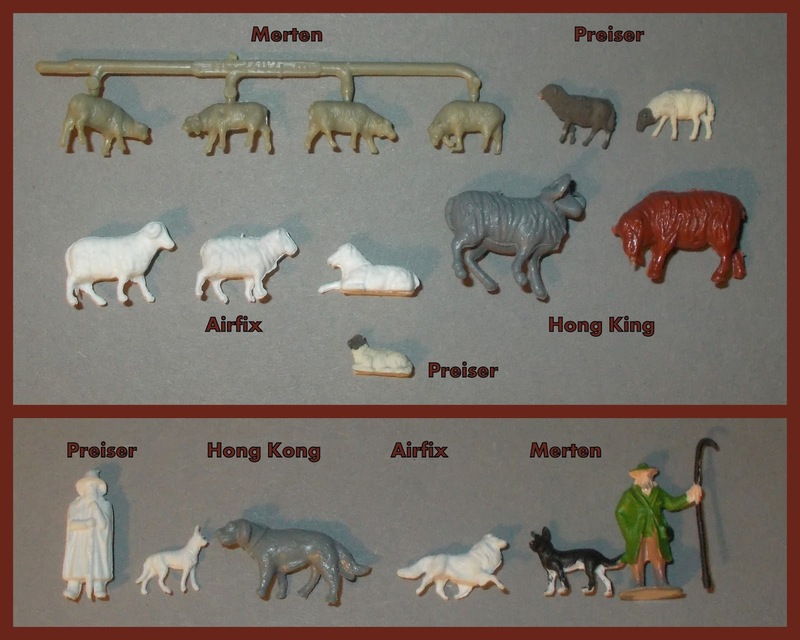 Airfix sheepdog compared with a soft plastic fox from the Marx Miniature Masterpiece range, in soft plastic he came in Jungle play-sets, in hard plastic he was paired in Noah sets. Comparison shot between the Airfix and late Hong Kong for Hornby Railways/Hornby Hobbies pigs, size wise they are slightly different, but the ears and snouts suggest different breeds, so they'd work together on the same model farm. ...before returning to the gloss yellow! 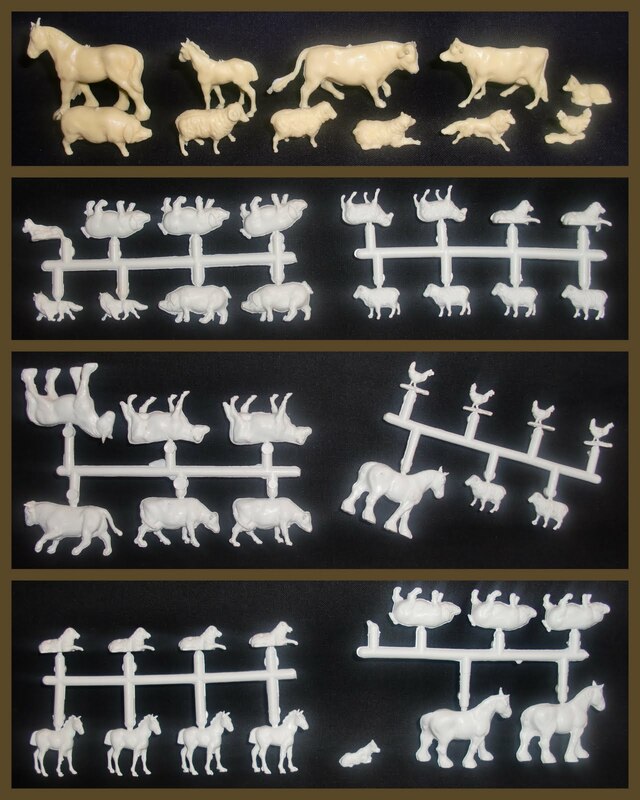 I think both the dogs work well here and the subtle little grey; top left. I seem to have taken Preiser/Merten comparisons again! Well I added a couple of HK examples this time, and the Airfix blog is supposed to be a scrap-book format! 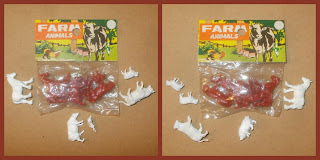 Blue Box mini-farm animals, also issued by Marx as part of their contract-manufactured Sunshine Series, as well as being issued under Tai Sang's other brand Redbox. Therefore - very common, but lots of sub-piracies so look for the neat HONG KONG marking. Factory painted HR Productions, sometimes misnamed as HR Products which confuses with a US after-market white-metal manufacture of some standing, these were issued in similar blisters to Merit and would have been direct competition, they don't seem to have lasted long. 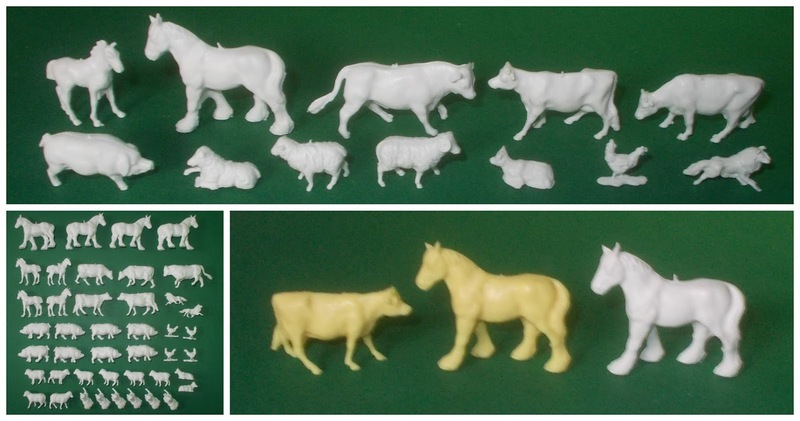 Some old images I originally posted on a toy animal-forum, might as well go here too; top image is one of each, full set bottom left and the cream issue to the right. 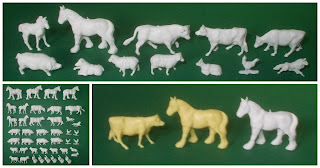 Size comparison shot with an HE marked cow I'm presuming was a Comet or Authenticast railway accessory in an HO-OO gauge-compatible size? 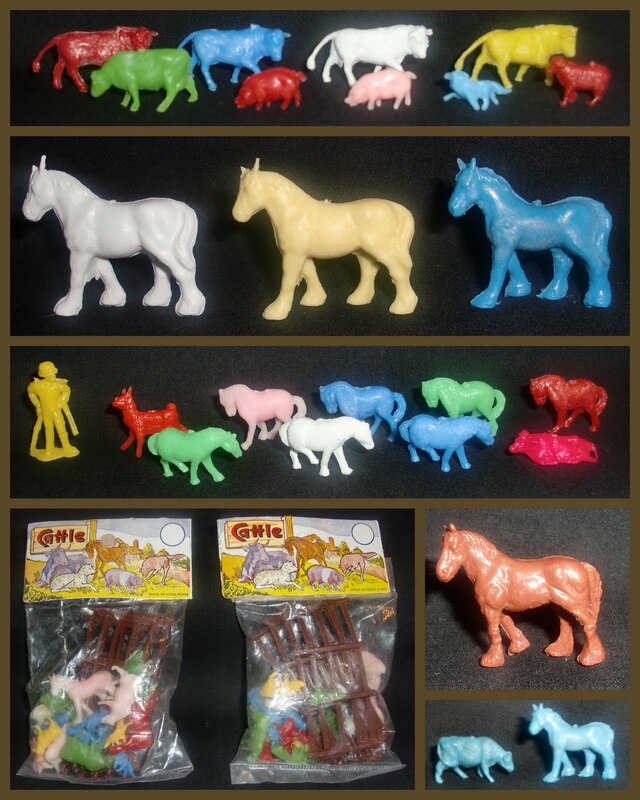 They (Comet) also produced a series of 1:100th scale architectural modelling accessories. 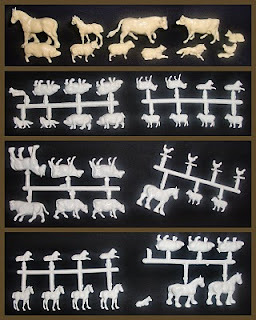 It may just as easily be SAE or something older and Scandinavian? 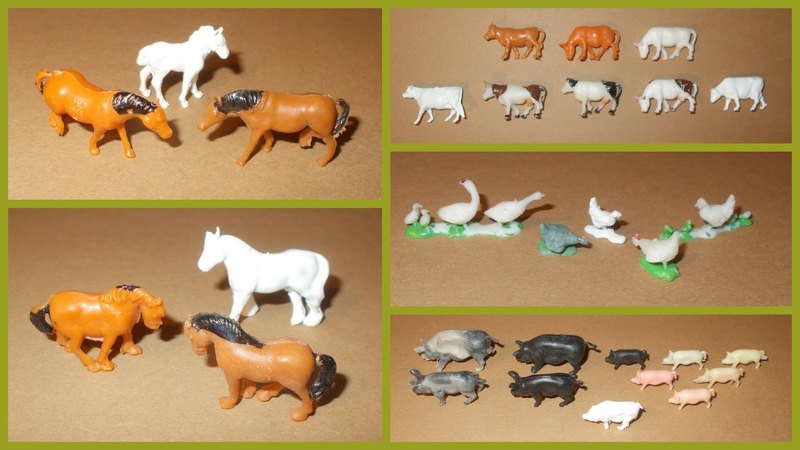 This came in at the recent Plastic Warrior Toy Soldier Show in Whitton (35th show/2018) and seems to be the source of the other (pale blue) heavy horse (in the early image near the top of the post), being a lesser quality set of sub-piracies - Farm Animals. A slightly smaller bag and card, with no room for silly over-sized fence sections! 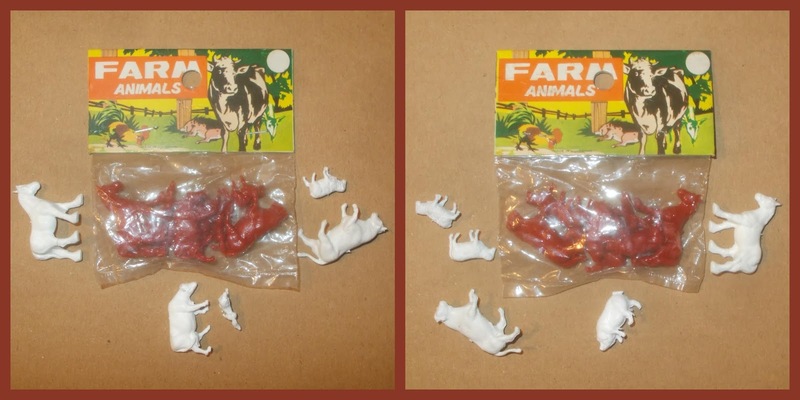 Notable also for being all the same colour, so probably a single mould-shot and more consistent contents than the assorted colours/poses of the 'Cattle' sets. If I find any more copies they'll turn-up here eventually.